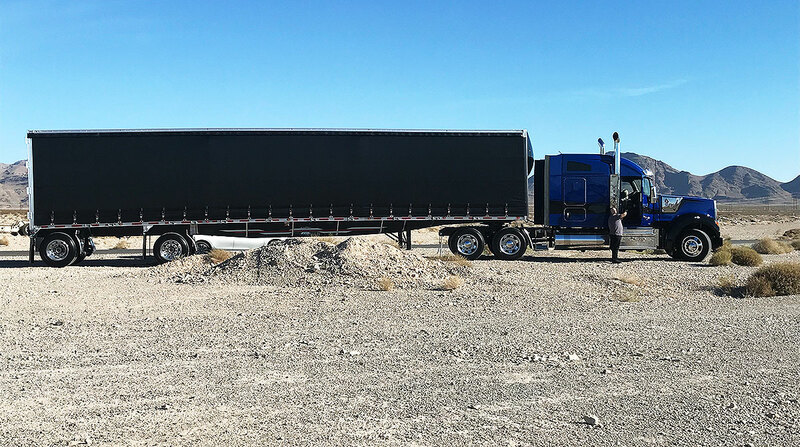 LAS VEGAS — Kenworth Truck Co. introduced its new long-hood conventional Class 8 tractor Sept. 27 at Las Vegas Motor Speedway. The Kenworth W990 will be available as a day cab and with 40-inch flat top and 52-inch and 76-inch midroof sleeper configurations, according to the company. The truck stretches 131½ inches from bumper to back of cab. Standard power will come from a Paccar MX-13 engine, with ratings up to 510 horsepower and 1,850 pound-feet of torque. A Cummins X15 is optional. Standard equipment includes Paccar’s proprietary 12-speed automated transmission, with an Eaton Fuller 18-speed manual as an option. Paccar’s 40K tandem rear axles are standard. The truck is slated to enter full production January. It is built on the same 2.1-meter cab platform as the Kenworth T680 and T880. Kenworth said the forward placement of the engine makes the cab quieter and creates more room under the hood for service technicians. Specifically, the engine bay was designed to create space between the engine and firewall. According to a company representative, the engine in the W990 is 6 inches farther forward, relative to the cab and firewall, compared with a T680 or T880. The interior of the cab is also larger, with 8 more inches of space between the seats. The mirrors were placed lower to improve the driver’s visibility. Kenworth said improved aerodynamics make the W990 as much as 3% more fuel-efficient than the W900. The truck comes standard with Kenworth’s TruckTech+ remote diagnostics system, a 7-inch internet-enabled in-dash HD display for navigation, roadside assistance, vehicle data, hands-free calling, audio control, blind-spot cameras and more. The truck has an 1,800-watt inverter with a shore power connection and four standard 120-volt outlets in the sleeper models. Sleeper models also include a swivel TV mount that can accommodate up to a 28-inch flat screen. The truck is pre-wired for satellite TV. The optional Driver’s Studio package includes a 180-degree swivel passenger seat, a rotating table for two, a refrigerator and space for a microwave. Kenworth said the truck’s design and manufacturing process took more than four years and was kept secret until recently. “The trucks were under wraps until about a week ago, completely under wraps,” Jonathan Duncan, director of design, told Transport Topics at the launch event. However, as the trucks were being transported to the Las Vegas launch from three sites — Chillicothe, Ohio, Renton, Wash., and Columbus, Miss. — Duncan said visits to numerous truck stops gave drivers a preview. Dozier added, “The W900L’s not going anywhere, but we’re planning for the future, and so [the W990] is another product to allow us to address what [customers’] business needs are as well as addressing what drivers expect.” For the foreseeable future both the W990 and the W900 will be built simultaneously in Ohio, the company said. Six longtime customers who had pre-ordered the W990 received their trucks at the event. For most customers placing orders now, deliveries can be expected next summer.